Those guys put my clay shooting skills to shame. 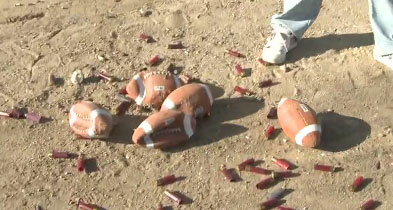 I imagine a kicked football travels a lot faster than a clay too. Bright flashes emanating from the football itself (especially clear in the police segment) tend to indicate “special effects” squibs more than genuine shotgun fire. Good catch.. that’s lame they did that! Like you said, during the police part its blatantly obvious. Actually the second kick made it over the bar so it should be one for the kicker, not zero, as stated at the end of the video. Football season! Duck season! Football season! Duck season! Football season! Fire!!! !